Over the years, I have found all kinds of applications for using Loc-Line hose and most of these have been for low voltage fixed lighting. I have designed and had a number of custom Loc-Line fixtures and components in this vein. One component I have had in mind for a number of years finally came to be. It is an anodized aluminum (6061) connector that provides a female 1/4"x20 thread at the end of a section of Loc-Line. By putting one of these at each end of the Loc-Line you essentially have a flexible tripod extension. Adding a socket set screw to one of the connector provides both male and female genders. In the photo above you can see a stalk assembly as well as a loose connector and 1/2" long set screw. The connector is not tapped completely through so there is a stop for the 1/4"x20 screw. The pilot hole does go all the way through so the thread depth could be extended with a tap if the need was there. In the example showing the Sapphire light, I removed the connector from the one end and slipped a section of 1/2" vinyl tubing over the loc-line and the sapphire is pressed into this tubing for a secure mount. In the image below, I used a rubber clamp that I got somewhere, sometime ago, mounted to one end of the tripod stalk. This clamp will hold any light with a 1" OD section. In the photo below, the SF Titan screws directly to the male end of the tripod stalk and I drilled a hole through the utility clamp and secured it to the other end of the tripod stalk with a 1/4"x20 screw. At some point, I want to consolidate some of the other Loc-Line custom connectors as well as get a few other ideas and components gathered together in a reasonable and more comprehensive "system" of gizmos. It just requires, time, money, focus and motivation; all of which I seem to be lacking in. In the mean time, if any of you guys are interested in one of these tripod stalks, I can turn this thread into an offering with the standard line of how to order and such. I figure $20 plus postage would be the price. The assembly would consist of 10 ea. of the Loc-Line hose sections, a socket - socket connector and 2 ea. of the aluminum 1/4"x20 connectors. One of the connectors will have a removable set screw in it. Basically the assembly is that shown in the first image above but not including the loose third connector or second set screw. 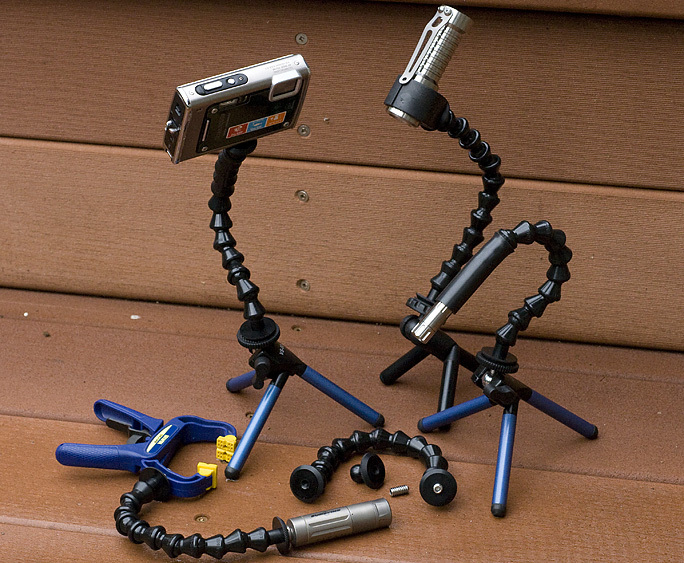 There are all kinds of the little desk top tripods to be had at reasonable prices and with so many of the small digital point and shoot cameras, there may be a market for this tripod stalk. 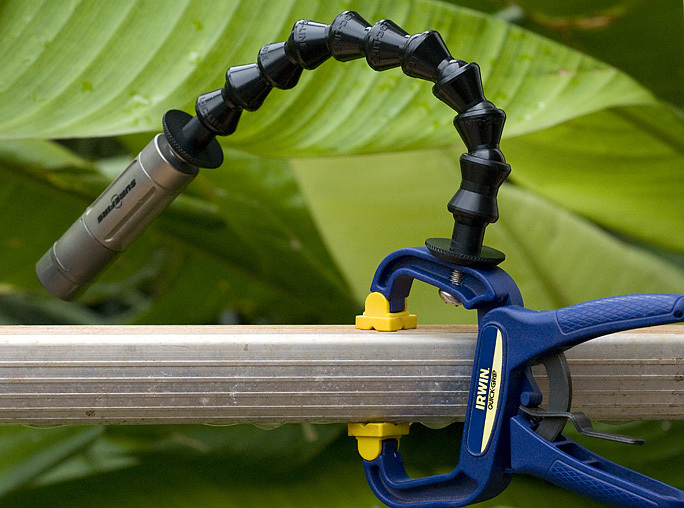 For those of us wanting or using a flexible stalk for hands free flashlight mount, with the addition of some type of flashlight holder, this stalk can be used in such a manner. Somewhere in Berkeley I have a bunch of magnets I bought years ago that would serve easily as a magnetic base for these stalks. Obviously at this point, many of these applications and ideas would require a DIY approach to a completed assembly and I welcome any ideas or examples to be shared here in the thread. A priority for me is a flashlight mount similar to the one shown above holding the SunDrop and before I go to the trouble of designing one and paying for a mold, I would like to see if I can find a ready made solution. EDIT See post #17 for info on these now being offered - Thanks! If the stalk is straight, at a 45° angle, about how much mass can the Loc-Line resist before it starts drooping? I could definitely go for one, possibly more depending on the answer. Good people need to be there for each other. It's the only way to stay sane in a sometimes insane world. I would be up for one please Don. I am going to order an AA pack once you post the sales thread. Maybe you could ship them together? I don't know how much weight the stalk can handle. A full size SLR will capsize it I am certain. No problem on including a stalk with another order. HELL YES. Finally I'll be able to use my Tasklight Two the way it was intended! The setup belongs to Keissling. If you asked really nicely, I bet he'd tell you what components he used. I think that is a mic holder there. The fork and eye as well as swivel are unnecessary with the Loc-Line but I agree it is a cool clamp itself. I wonder if the spot where the ball joint attaches could accept (or be modified to accept) the 1/4" threaded stud you've made? I'm interested, and will probably request one along with a 2AA Pak tomorrow as well. 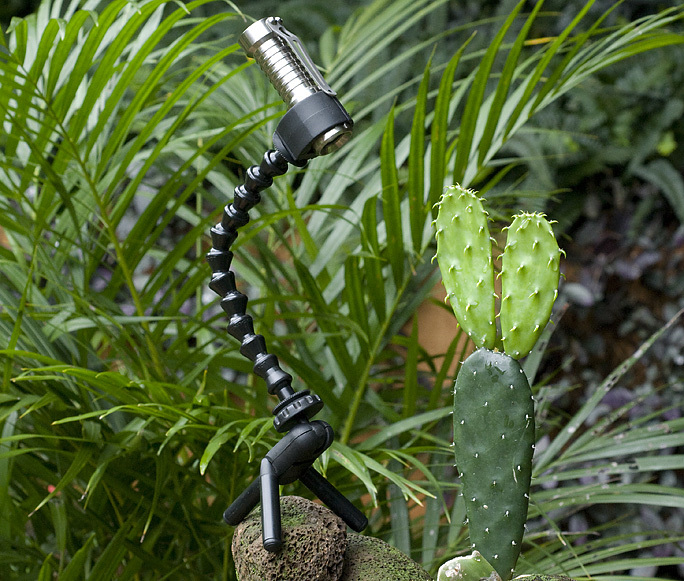 I'm chuckling at the possibilities (and looks) of this stalk mated to a Gorillapod. I'm definitely interested, Don. Especially if someone can find a source for clamping our McGizmos (no pun intended). This would be a really cool flashlight / desklight / camping light stand! I could definitely picture myself using this in the future. Cheers from the McGizmo state. Yes, a mic stand. Nothing special. There is a type of perfection that transcends the quest for lumens. Buying a $250 1-cell light for "lum factor" is like buying a $250 single malt Scotch for the alcohol content. It's always darkest just before it goes pitch black. My shoes are too tight. But it doesn't matter, because I have forgotten how to dance. You can count me "in" for two of the $20 kits. New user here. I am interested in one or two as well. Great idea Don - i'd be in for 5. We use them at work -though a different brand -Irwin , i think. Would be great for holding any shape/size light(within reason). Those clamps look like a great idea and I like the price! I suspect one could be successful with crutch tips and round table leg boots in coming up with a mount for flashlights as well. I am a bit overwhelmed at the moment with some builds and the introduction wave of the 2xAA McClickie paks. Some of you have requested a tripod stalk or two with your orders of other stuff and I am honoring those requests and including the tripod stalks at a cost of $20/ stalk. Until I get my act together and turn this thread into an official offering, don't let that stop you if you wish to get a tripod stalk or two. Unless you have 5 off lying around! hehe. If you want one or more of these, you can send me an e-mail with tripod stalk in the subject line and your mailing address in the body of the e-mail along with a clear indication of the quantity you seek. The price is $20/ stalk and the priority mail or international priority mail is additional. I will respond with a postage notification e-mail and the total will be in the subject line. My PP address is the same e-mail address as linked above. My stalk arrived today and I couldn't be happier. Thx, Don! That reminds me of War of the Worlds, gswitter! I missed that earlier. A 1/8" hex wrench can be used to tightened it down or loosen it. Last edited by wquiles; 02-14-2010 at 04:00 PM. Hi Don. Email sent. Mahalo. Paypal sent for one ea. Doc. Try the Matthews or avenger catalogs for photography, and motion picture grip equipment. There are a ton of clamps, and things to hold just about everything, most everything also has a 1/4 20 attachment. There is no way I can use the plastic grip arms for the work we do, our equipment is too heavy, expensive, and for now ...not replaceable because of the earthquake. Mole Richardson in H' Wood has a fantastic selection of grip arms metal goose necks and clamps. 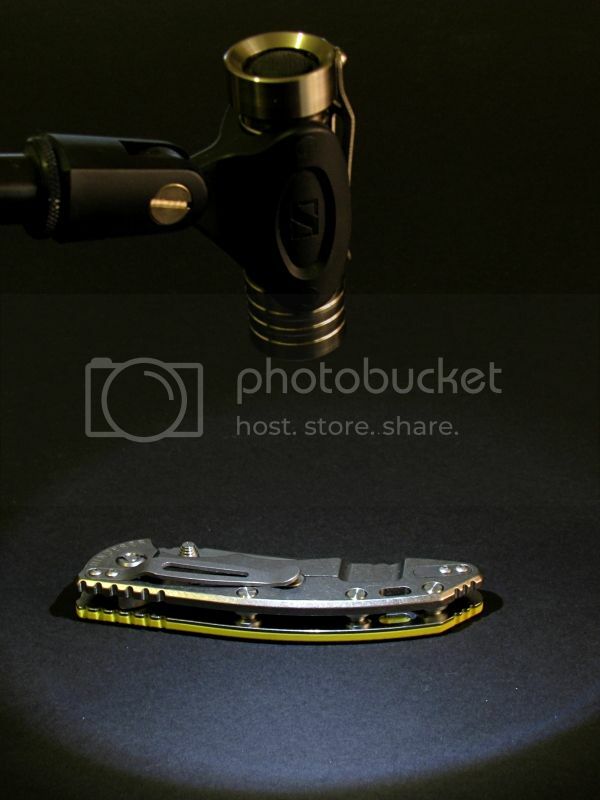 The Nano clamp and arm from Manfrotto is amazing. We have a few, but they are expensive. I am just too used to metal for this, since I hang cameras and lenses worth tens of thousands of dollars on everything from helicopters, the flightdeck of the USS Ronald Reagan, above the ring at big fights in Las Vegas, and with the POTUS, and other places we can have no failures, and places not friendly to our gear if something does go wrong. I mostly skip the things made for photographers, and use the motion picture grade grip gear. Part of being a good gaffer is being able to put anything anywhere, anytime, and fast. This could include a flashlight as well. Last edited by RedLed; 05-04-2011 at 02:28 AM. Hello, are these still for sale? 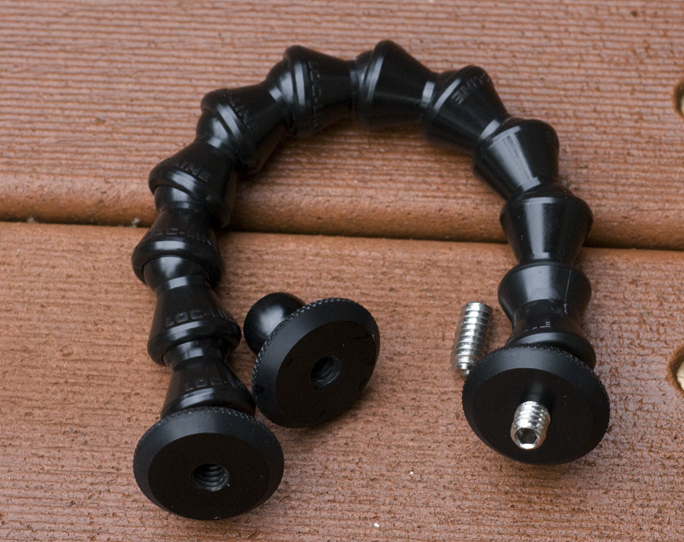 My Gorillapod Magnetic isn't tall enough so I'm thinking I need this extension (Spark SD6 NW desklamp). What's it's full height? How reliable are these things before they start to sag? I just wanna make this clear: we get two socket connectors, 10 pieces, and 2 aluminum screws? Thank you. Last edited by excfenix; 02-01-2012 at 01:41 AM. I still have some of these. The offering is as shown in the first pic but not included are the additional loose connector and 1/2" long set screw. I have no idea how much weight it can support without sagging. Sorry.